A Bullet in the Ghats – one of life’s pleasures! Motorcycle touring to me has always been a strange combination as a means to an end, and an end in itself. By that I mean that it is an unbeatable way to experience somewhere new, and it is the experience itself. Touring India on an Enfield, to most people, is a double experience. The sights, sounds and smells of India are unlike anywhere else, and for most of us, it is a first time on one of motorcycling’s great anachronisms, a 1950s designed motorcycle in the 21st century. I am always saddened when potential customers talk to me and insist that the only way to see anywhere they have never been is on their favourite bike, be it a GSXR, a BMW K1200LT, or whatever. Remember, travel broadens the mind! We are usually ready to accept that we should try and conform to local customs - whether it be removing shoes before entering, covering up bare shoulders or adopting local mannerisms and customs – and that should apply to the local means of transport. Take it from me, your GSXR or BMW wouldn’t last an hour in Kerala, they are about as appropriate as an SUV in central London. The Royal Enfield in India has survived because it is well suited to its purpose in the road conditions that prevail, just like a Harley-Davidson is in America, or even a GSXR in England! Our trip started in the chaos that is Heathrow Terminal 3 on a quiet day. After finally checking in we ran the gamut of jobsworths shouting that only 1 piece of hand luggage is allowed (plus the usual lack of liquids, face creams, etc. ), we get our helmets through the hand luggage X-ray machine without even a murmur from the people actually manning the machines. One change of plane later – and service on the domestic flight from Bombay to Cochin was every bit as good but without the entertainment – and we arrive rather tired but excited at Cochin Airport – small, friendly, efficient, and a pleasant 26 degrees in November. I won’t mention the weather again, it stays a uniform 26 ish on the coast, a bit cooler in the mountains, a reasonable amount of shade, and sunny most of the time. Daniel our guide and Niyaz, our driver, are there to meet us. Daniel has one of life’s great jobs and clearly relishes it. Niyaz is a marvel – we soon discover that not only can he get a jeep through a gap in the traffic that you have just squeezed through on an Enfield and thought yourself a brilliant rider in doing so, but that he has a black belt in Indian paperwork and official government permits. We head into Cochin to our hotel, Brunton’s Boatyard, a slice of cool, post-colonial luxury set in the old colonial part of Cochin. Just down the road is the oldest Christian church in Asia, built in 1503, and the famous Chinese fishing nets and fish market, the other way is Jewtown with its architectural salvage yards, serious tourist shops, rice and spice merchants and more people than you can imagine filling one space. Our view is across the narrow harbour entrance, with its bustling ferries, fishermen’s narrow boats, dredgers and the occasional container ship blocking out the view they pass so close. So, after a bit of sightseeing and a relaxing beer by the pool, we take the complimentary harbour boat tour at sunset, don’t forget your camera. Then a short walk brings us to our welcome dinner, al fresco on the water’s edge. A few words of advice from Daniel on what to eat and what not to eat and we settle in for a relaxing evening. After a very comfortable night, we awake ready for the adventures ahead. The jetlag and cultural adjustments still need to be worked through the system, so our first day’s ride is really just an introduction to the adventures ahead. Part of the joy of riding in Kerala is the ever changing scenery, helped by the famous backwaters – a huge low-lying tract of land and water about 15-20 miles wide and 100 miles long – and impressive Western Ghats, mountains rising to over 2000 m straight up from the backwaters and then dropping even more abruptly into the flatness of Tamil Nadu to the east. We meet our bikes, and Ranesh, their proud mechanic, and a man who can fettle (great word) an Enfield like no-one else. Daniel looks like the aviator out of Mad Max 2 with his goggles and kidney belt and a big grin. My trusty steed is a classic black with gold pinstriping and aftermarket rear gas shocks to make life a little more comfortable. The intricacies of the right-foot gear change and selector are explained as is the starting technique, and after a quick practice we are off. We head south, out of the old town and immediately into an area of fish farms. This is the coast road (replaced by a ‘highway’ which we will tackle later in the tour) to Aleppey, a bit wider than single track, hopefully when needed with a sandy verge not a ditch on either side. The road surface is mostly tarmac, but the adjective smooth really isn’t appropriate, and the whole width of the road is teeming with mopeds, people, animals and the odd truck and car. We learn to pick our way round the worst of the bumps and holes, we learn that the horn is more important than the brakes, we learn that there really are an awful lot of people living and working on the roadside, and we learn that 20-30 mph really is about as fast as you can go safely. By the time you’ve followed Daniel’s route through the bumps, avoided the mopeds pulling out, waved at the schoolchildren and tried to take in the unfamiliar sights and sounds your senses are loaded to the max. We stop for our first drink, right by some Chinese fishing nets. The choice is chai – local sweet tea (more on this later) – or lime soda, which comes sweet or sour. Sweet is mixed with fizzy lemonade, sour is mixed with local seawater. It certainly tastes that way, but hey, you have to try these things. Another hour’s ride through a continuous trail of fishermen’s villages and we reach our next hotel. This is a complete change from the almost cosmopolitan ambience of Cochin. Each ‘room’ is a palm-thatched bungalow with a veranda, of course. The bags are in the room by the time we’ve completed the check in formalities and drunk our fresh ‘welcome’ coconut juice. Daniel gives us a quick guided tour, including the ayurvedic centre, the pool, sundowner bar, and the completely empty wide sandy beach. And after a quick lunchtime snack we unwind. The massages are a definite must, as is a swim in the warm waters of the Indian ocean, some time in one of the many hammocks near the beach, and sunset on the beach (when it suddenly gets busy). The evening meal is a gourmet buffet of mainly Keralan dishes, none of which will have been available at your local Indian restaurant back home. Nothing too spicy, but lots of fresh local ingredients and very tasty. Then it’s time for one last drink before heading back to the bungalow, perhaps a quick read (no TV!) and a good night’s sleep. Total distance 50 km in 2 hrs. Up bright and early this morning. After a great breakfast with a wide choice of Western and Keralan dishes (I loved the dhosas) we’re really off. We load the jeep up with luggage and carry on down the coast road to Aleppey with its grid system and canals hidden amongst the throngs of people, mopeds and bicycles. My first embarrassing moment happens as I get the right foot gear change completely wrong on a right turn up onto a bridge. Niyaz offers protection from behind with the jeep as I try and remember how to find neutral quickly and get myself sorted and rolling again. Everything slows and waits and I suddenly actually feel safer than in an English city. Embarrassment over, and we are through Aleppey and out on the causeway over the Backwaters. Local fishermen lay out this morning’s catch by the roadside, which is presumably diesel or oil cured by teatime. Once across the backwaters we start climbing very gently up into the hills. The scenery slowly changes as we rid through small towns and increasingly lush vegetation. We make an impromptu chai stop in a small village. The tea is hot and sweet, and I was told the Indian meals were good. We have timed today’s ride to coincide with a pilgrimage, so the roads are packed with pilgrims from all over India, in a wide assortment and age range of cars, minibuses and trucks, clogging up the roads and slowing our progress even further. We stop half-way up a mountain at the Kerala Hotel, which like all hotels in Kerala isn’t a hotel but the Indian version of an American diner. This one is nice and smoky, with a talking mynah bird, but very slow service as they struggle to cope with the influx of pilgrims. For the women, it’s a first experience of the local ‘facilities’, and a warning to make full use of our overnight hotels and to always carry some loo paper with you. How women in saris cope is beyond me! As we climb, we reach our first rubber plantation, which seems to be in the middle of converting to other crops – pineapples being obvious to us – and the views open up due to the cleared land. A well-disguised right turn – road signs are not high on the Ministry of Transport ‘to do’ list – and we are off the main road and the pilgrim traffic and into our first wildlife reserve. The glimpses of scenery through the trees reveal steep wooded valleys, there is almost no traffic whatsoever, and only a very few people - maintenance men clearing roadside trees and appointing the barriers. The quietness is striking after the manic bustle of the towns and roads, but we still need to watch the road surface. For the next few hours we will be on effectively single track roads through the reserve. The road is seldom used and Daniel has exclusive permission to bring bike tours through here. Our paperwork is checked at the government checkpoint by an official with a serious moustache. Daniel does his soft-soaping and Niyaz sorts the paperwork and we continue, past tumbling streams, brightly coloured butterflies, mountain streams and lots of trees. A lot of trees! We stop for lunch at the staff canteen in the main reserve village, with its buildings labelled for assistant engineer, chief assistant engineer, Chief Engineer etc. The menu is fairly restricted, and we are served a local dish of curry with assorted side dishes. There is a distinct lack of cutlery, the room is quite dark, possibly even dingy, but nonetheless just fabulous. Ranesh has a quick fettle of Daniel’s bike, and we’re off again. The reserve is a main source of water for the irrigation schemes of Tamil Nadu, and we ride around three reservoirs and cross the dams. The schemes were built by the British over 100 years ago and you have to be impressed given the locations – I suspect a lot of the tarmac is original as well! The reservoirs are breathtaking in their scenery and solitude. We cross the final dam, the Periyar dam, currently rather controversial and therefore with a little more attention paid to paperwork. No photos allowed here, according to the rather aged yellow and black signs. Up the hill, and smack into a work party clearing bamboos from the roadside and loading them onto a brightly painted truck. The only problem is there is no room to the side and there’s a drop off several hundred feet. The truck moves a bit, we squeeze the bikes through, and not for the first time Niyaz gets the jeep through a gap half the width of the jeep itself! Then we loop downhill, get our papers checked again and we are out of the reserve. That was about 50 miles with only 1 vehicle. We pick up a main road again, and then just as we think the roads are getting busy, we’re off again, this time into a tiger reserve (yes, really). The roads are generally better and much to our elitist dismay, we see other western tourists on day trips in jeeps. There’s a lovely section of sweeping bends rising and falling along the river bank. Paying serious attention for jeeps flying round bends in the opposite direction we stop to watch some monkeys, and then reach the exit checkpoint. Much fumbling of paperwork, platitudes and being passed from one official to the next and we are ‘free’. That evening we discover that tigers have only been sighted twice in the last 6 months, so we were pretty safe. We are now on the main road, and for the first time we can swing the Enfield through sweeping bends on a proper road surface with few bumps and not to many stray bodies and bicycles in the way. A great final stretch that brings us to another superb hotel in Kumily. This time we have a duplex bungalow, just as big as last night, again in acres of grounds. All of the trees planted are spice or fruit tress, all labelled. There is a wildlife room, a colonial style bar with lots of great old photos, a pool and again, no TV! Dinner this evening is in a small ‘hotel’ just down the road. The only drawback is that they no longer have an alcohol license. Daniel explains these are very expensive to buy, and most places simply don’t have a license and sell beer etc until they get caught. Total distance 207 km in 10 hours. Having climbed up into the Western Ghats, today we get to see them from the other side. After another good breakfast we check out to find the bikes ready and waiting and the jeep loaded. As soon as we leave Kumily, the road descends through the trees. We catch brief glimpses of a lot of space and then as we round a bend Tamil Nadu opens up in front of us, about 600 m down the world turns flat for as far as the eye can see. We overtake a bullock and cart (our first) and stop to take a photo. The driver waves, and a monkey appears just to make sure he’s not missing out on some food. The road then crosses the water pipes shooting straight down the mountainside, several times as we twist and turn to the bottom. The temperature rises and road goes arrow straight. It is in reasonably good condition and we crack on at about 80 kph through the irrigated fields and palm groves. As we pass through villages there’s a distinct change in the colourful saris, which are now light pastel shades, and the people are smaller and much darker skinned. We weave our way through the traffic of Cumbum, the first major town, and find our side road without the help of signposts but from a few shouted requests from Daniel just to check we’re on track. Then we head back up into the hills, a seriously steep rise up a twisting mountain road, suitably narrow enough for a car and a half, with great views looking back. As we reach the top, the temperature cools right down, and it is time for a chai stop. A pretty good road surface now, as we swoop up and down the hills, through villages (always watch out for roadworks in villages) and on to our lunch stop in a nice ‘hotel’. Biryanis are the house specialty, so everyone apart from Ranesh, who needs meals with extra rice to keep going, gets stuck into a beef or chicken biryani washed down with refreshing jeora tea. We’re about to enter tea country, so Daniel gives us a quick explanation of the afternoon’s ride and we’re off again. More perfect roads suddenly give way to serious road works and it is a couple of miles of pre gravel before we reach tarmac, and we realize from its condition why they are resurfacing. This is a main road to Munnar, tea capital of southern India, British Raj hill station and up and coming tourist stop. 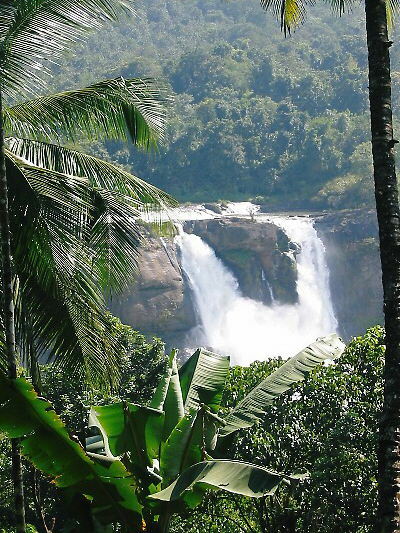 We rest at a spectacular waterfall with great views across towards Munnar, and then head off. A quick climb through palm groves, cardamom and banana plantations and the scenery opens out – its tea time. It looks just like on the adverts, but the scale is huge. Tea bushes and shade trees as far as the eye can see, with a narrow bumpy road with whitewashed edge markers. We see our first ‘gang’ of pickers – always women, with a male planter supervising. The women are really small and just the perfect height to pick the leaves on the slopes. Men say that only women have nimble enough fingers to pick the tea, but as some of them now use a kind of shears I’m not sure the argument is quite as strong as is claimed. I think it’s just too much like hard tedious work. After a few miles we round a bend and the view opens up across a reservoir to tea covered hills in the distance. After being chased by a plantation jeep down the road, we let it pass as we reach the main factory entrance and a tea stop. If you haven’t tried it, 10 people is the average number you can fit in a jeep without losing any out the back as you bounce around corners. We watch the freshly picked sacks being delivered into the factory for ‘processing’. There are huge piles of logs for the burners, managers bungalows dotted around, and the schoolchildren just coming out of the plantation school. Bizarrely the tea you can buy here is only in granular form, all the leaves end up in Europe! After our afternoon stop we climb a little higher. For the past couple of days we have seen signs for the mystical nilgiri flower, asking us to preserve and respect wildlife. The nilgiri flowers only once every twelve years so it needs some protection from tourist and tea planters. Daniel has never seen it before, but because we’re here, we see some – delicate pink flowers in a small dip near a huge towering waterfall. It’s a fabulous spot, with the clouds forming above the waterfall and the view across the valley. The road over Lockhart’s pass is a bit daunting, but once done, seems easy, and it is a gentle cruise down to Munnar, sweeping round the bends. Our luxury hotel overlooks the town, and our room, perched on a ride, has views from both front and back. We’ve been on the road 7 hours and covered all of 116 km up and down the hills. Just such fantastic changing scenery. Dinner tonight is in the hotel, again an excellent buffet of Indian dishes, with setting views over the town. This afternoon and tomorrow are a bit of a cheat, as we’re taking a short cut from the normal tour route to explore some new roads and check out a couple of places (to keep the taxman happy!). We leave Munnar and climb eastwards and upwards. After an unusual alpine section with meadows, the first we’ve seen, cows, small villages and surprise surprise, more tea plantations. This time, it’s just one plantation all the way up the valley, the largest in the world. The twisting bumpy road, by now expected, continues until we are too high for the tea and we can look back down the valley and across and up to Ana Mudi, Elephant’s Peak, the highest peak in the Western Ghats. Ana Mudi does indeed look like the elephant it is named after, and will be a constant companion for the rest of the morning as we enjoy a gentle ride down through more tea plantations. The mountain views are great, the roads are lined with bright red flowering trees, there’s no traffic and the sun is shining. Am I happy? As we lose altitude the tea plantations give way to palm trees, bananas and spices. Our lunchtime stop in Marayoor is an early one, but as Daniel explained, there isn’t much for the next few hours. There’s time to walk down the main street, stretching our legs and looking at the stalls and shops. Back on the bikes we continue down until we reach the entrance to Chinnar/ Indira Ghandi wildlife reserve. We are met at the entrance by a motley crew of monkeys on the bridge. This is also the ‘checkpoint’ to cross from Kerala into Tamil Nadu. The Keralan official says the road is rubbish, the Tamil Nadu official says it is very good. The road starts out really well as we enter the park, with its lowland streams and grassy vegetation, and then our Keralan official is proved right. All of a sudden the tarmac stops and it’s a grave road. After a few hundred yards there’s a gang of workmen and women breaking boulders, and grading stones, and again a few hundred yards later. Almost until the end of the park we bounce slowly over the stony road surface until the end is in sight, the checkpoint is crossed and we stop for a welcome drink, after the exercise we’ve just had. As we recover under a shady tree, we realise that the tiny shack we are standing next to, little more than an AA box in size, is in fact the local barbershop, with barber and customer inside. We all agree none of us needs a haircut, but it’s good to know where the nearest barber works. We are now riding on mainly straight and flat roads through small farming villages (unlike in Kerala) often with concrete houses (again unlike Kerala). Apart from the intensive agriculture, there’s much weaving of palm leaves, to remind us of our hotel roofs. We then reach a crossroads, and turn left straight towards the mountains again. The road surface is pretty good now. At the foot of the hills we go round another reservoir, but this one is almost in the plains, and much wider and ‘flatter’. After another checkpoint we start climbing. After about 10 minutes we get to a yellow and black sign fixed to the wall of a bend. It says 1 / 40. Daniel explains – the first of 40 hairpins. Who needs the Alps! And unlike European hairpins, Indian hairpins not only have numbers, but several other bends in between. We ‘race’ up the bends, overtaking everything in sight – the Enfield really is King of the Road here! With several stops to take in the breathtaking view, and the colonial era pale blue painted walls of the road snaking down below us, we finally reach the top, and the hairpins continue as we drop down a bit. Into tea plantation country again, we take a quick pause for a drink at the memorial to Carter Marsh from Essex set on a small promontory overlooking what was once his empire and on the Valparai, a tea town well off the beaten track. The road has gradually got worse as we come into town, past the bright red painted police station, huge pale yellow temple and into our hotel. This is the only hotel for very many miles and it shows. It isn’t one we have ever used on our tours, but it is a reminder to us of what you get if you travel India on a budget, or if you fall into the sales patter of someone offering cheap motorcycle tours. Yes it is only £6/night, but you’ll still feel ripped off! After a wander around town, with lots of giggling schoolgirls who clearly don’t see many white tourists, we returned to freshen up for our evening meal. The menu looked impressive, and we were shown into the family room, with only slightly stained walls and ceilings. When it came to ordering, we soon discovered that the menu selection was reduced to two dishes, beef or chicken curry. It tasted ‘O.K’ though so we made the most of it before retiring. The rest of the hotel had been booked to a Tamil film company shooting a film. We had hoped to be among the stars, but ended up among the crew. That meant cooking in the corridor, a late night, and the director waking the whole hotel at 4 am for an early start. Just as we got back to sleep, the temple loudspeaker started up at 5 o’clock, and continued until 6.30. 6 hours, 154 km. Breakfast was eaten as fast as we could – we had to wait while they went and bought the toast and jam - we grabbed a few succulent red bananas from a local stall and got out as fast as we could. Penny, my partner, made only one comment - this was the worst hotel she had ever stayed in. The road out of town was the worst yet, and continued most of the morning. The scenery more than made up for it as we rode through tea plantation after tea plantation. After about 90 minutes we had covered about 25 km, and it was time for a chai stop. We stopped at a plantation village and went into a smoky room with the Ashes test match on a TV in a corner (they are definitely fanatical about their cricket in India). The dhosas were excellent, the chai hot and sweet, and surprise, the place was excellent and even had a great view out of the open window across the valley. If only they had rooms for the night! The plantations finally ended as we started dropping down. We hadn’t seen a car all morning and another ride alongside a reservoir in complete solitude just reminded us of why we were here. After a further slow ride we headed down another hairpin hill (only this time discovered some more white tourists in an aircon MPV) and came to the river crossing. Definitely time for a pause and a refreshing cool drink, take in the river, the kingfishers and other birds. The road improved as we approached the Richmond Falls, a popular destination for school outings. We were in time for a late lunch at the Hilton Hotel (no, not that one! ), overhanging the river bank with a slight view of the falls – and they are impressive. One quite hot but excellent biryani later and we’re back on the road – excellent tarmac, two full width lanes sweeping bends and little traffic. Sharp braking and a quick left turn got us down to the ferry – two fishing canoes tied together with planks of wood that could carry a couple of cars and a few bikes. The ferry took us into a very large rubber plantation, offering pleasant shade in the afternoon sun. After the necessary paperwork we were back on the main road, before turning off into another reserve which we had gained exclusive access to. Again the quiet struck us, with no other traffic until we reached some canal construction. Shortly after that we reached a large lake, and after riding through a rather enthusiastic stream up to our axles we stopped for a cool drink at a snack bar overlooking the lake and next to the entrance to a shrine to St Thomas, the disciple who went to the Malabar Coast in the first century AD. Back on the Enfields, and another stretch of reasonable main road, which gave way to 4 miles of interminable bumps to our hotel. But it was worth it! Situated on one side of a lagoon crated by a nearby river dam, the Bird Lagoon was just fantastic. Watching the village life on the opposite bank birds gathering at dusk while relaxing with a cold beer was just what we needed, followed by a quick shower and dinner al fresco. 9 hrs, 146 km. An early start this morning – a breakfast boat cruise. We all meet up at 7 am, board the small boat and head off. Across the lagoon, under a bridge and we’re in the main flow of the Periyar River. In the middle of the river local men are dredging (illegally) for sand, using long poles with soft ‘buckets’ attached. Once the boat is full, ie with no more than 2“ of boat above the water, they head back to unload the cargo, to be sold on for building. Quite an enterprise, and it’s amazing just how much sand and how many people you can fit into a river fishing boat. We cross the river and head into a few tributaries. We kill the engine and the only sound is birdsong, and we just sit in the early morning sun, with the shafts of light coming through the trees, taking in the beauty and peace. On our way back we watch a family of monkeys making their way through the treetops. We can’t stay long as we have to get back to Aleppey by lunchtime, and we are back in the densely populated area surrounding the backwaters. Progress through the towns and villages is slow, but our reward is a real working elephant coming towards us on the road, a load of banana plants in his trunk. After crossing the backwaters we meet up with our backwaters guide in Aleppey and go to meet our houseboat crew. For the next 24 hours it’s just the two of us cruising gently through the backwaters with our personal guide and crew. After a welcome coconut drink we settle in for lunch and then head off. The sun is shining, the banks are full of people washing, fishing building and repairing boats and life really is quite pleasant. We learn about life on the backwaters and their history. One of the crew is also a crew member of his village’s snakeboat, which is raced at festival times against other villages on the backwaters, and he explains the racing and the festival as we pass one of the boats and the race finishing line. Dusk sees us tying up for the night, dinner is served to the sounds of a local church choir practicing, and after lashing of mozzie repellent we just settle in for a relaxing evening. 4hrs, 105 km. This morning after another excellent breakfast we make our way gently back to our harbour, and meet up with everyone. Then it is an easy 30 km ride back to our beach hotel. Our holiday is nearing its end so we jump in the hammocks again and take in one last tropical sunset. Riding an Enfield Bullet ! Great tour organisation through H-C Travel, www.hctravel.com.